It might not be as famous as ‘Malana Cream’, but cannabis from Sonamura of Tripura’s Sipahijala district is no less a brand. In fact, Tripura came to be infamously known as the cannabis corridor of North East for the heavy bulk of the illegal ‘herb’ that went from here to Bihar, Uttar Pradesh, Delhi and even in the opposite direction to Bangladesh. But, after Biplab Kumar Dev took over the reins of the State, a series of stringent actions from the Tripura Government, cannabis growers now face severe livelihood crisis, triggering an exodus of people leaving the State in search of jobs. The report further stated that the situation has changed drastically in 2018. Since the BJP-led coalition Government with Indigenous People’s Front of Tripura (IPFT) assumed office on March 9 last, a crackdown on the marijuana business was initiated. In its campaign for the Assembly election in February, the BJP had promised action against the drug trade in its Vision Document. 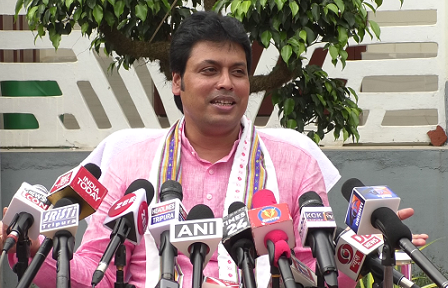 Chief Minister Biplab Kumar Deb, who also holds the Home portfolio, says 1 lakh kg of cannabis was produced in Tripura annually for the last 25 years. He blames the erstwhile Left Front government for encouraging ‘hemp’ cultivation and leading youths towards the illegal drug trade. In the five months since March, after Deb took over, police have reported that over 20,000 kg of processed ‘ganja’ was seized across the State. However, the Government crackdown has dealt a heavy blow to thousands of families who used to depend on marijuana for a living. Eighty youths reportedly left Kamalnagar and Kamalchowra villages for Chennai and Bengaluru in search of odd jobs, working as security guards and in restaurant over the past two months. A local resident admitted having cultivated cannabis since he was a teenager. He said the previous Left Government didn’t take any action on cannabis growers and most people living in bordering villages of the district felt it was legit. “The police often came, took bribes and left. There was no strict Government action. Sometimes, they seized a small chunk or destroyed a small plantation, but most produce was let be. An entire generation of youths grew up cultivating cannabis. Now, with the Government crackdown, we are left without any other job,” he said. 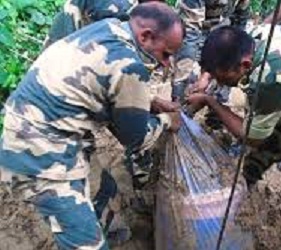 Another villager from Kalamchowra said the Border Security Force (BSF), Tripura Police and Revenue Department officials are now launching joint raids. Cannabis plantations and nurseries, which were grown under the garb of being rubber or betel leaf plantations, are also facing the heat. “Cannabis cultivation used to be a contract wage system. There were people who supplied fertilisers and seeds and there were those who provided transport and other logistic support. There were also middlemen who arranged sale. Now they are all in jail. We are in deep trouble and don’t know what to do. There is no work,” he added. Meanwhile, the administration is planning to grant alternative livelihood sources to former cannabis cultivators and rehabilitate them. Sonamura Sub-Divisional Magistrate (SDM) Saju Vaheed said he was drafting a plan to replace dependence on cannabis with pineapple, bamboo and other crops which abundantly grow in the region. “We have a task force working 24×7 to track, identify and destroy cannabis plantations. So far, our success has been impressive with 6,549 kg cannabis seized till July last year. The figures are over 18,000 kg this year,” he said. Over 70 cases have been registered in Sonamura sub-division alone. With no alternative livelihood option available now, the locals are coming up with their own solutions. “Why doesn’t the Government legalise cannabis and end this debate? Alcohol too is equally bad but is sold in licensed shops,” said a Sonamura resident. In fact, Uttarakhand legalized Government regulated cannabis cultivation in 2017, allowing farmers to grow hemp with Tetra Hydro Cannabinol (THC) content below 1.5 per cent for the fibre manufacturing industry. For the record, the infamous ‘malana cream’ of Himachal has over 30 per cent THC. But legalising is not easy as cannabis is prohibited in India under the Narcotic Drugs and Psychotropic Substances Act, 1985. Besides, India is also a signatory of the United Nation’s Single Convention on Narcotic Drugs Treat in 1961. However, many countries like Uruguay, Portugal, Spain, Canada and some US States have partially or fully legalised personal and medicinal use of cannabis in recent years and there is a worldwide movement for cannabis legalisation and against the Single Convention. BJP spokesperson Mrinal Kanti Deb denied any scope for legalising cannabis and said it has “no medicinal value” and can’t be equated with alcohol, which is often prescribed by medical experts for limited consumption. “Our Government will achieve a cannabis-free Tripura. There will be no compromise on ganja. Youths will be adversely affected by it and the society will be affected if it is legalised,” he said. Deb said youth would be empowered through “skill development and assisted for gainful employment”. Senior CPI (M) leader Sonamura MLA Shyamal Chakraborty said his party doesn’t support cannabis legalisation. He claimed the erstwhile Communist regime initiated action against marijuana and other drugs, but was being defamed by the BJP for political reasons. Chakraborty admitted that there was an exodus of people out of Tripura in search of jobs, but refused to attribute it to the crackdown on cannabis. “Public work has come to a standstill since the BJP Government came to office. All tenders passed by the previous Government were cancelled. Construction workers, maintenance labourers and people in many other sectors have been rendered jobless. That’s why they are leaving the State,” the MLA said. Economist and Tripura University teacher Dr Salim Shah said cannabis legalisation may slightly help the economy, but it is likely to have a vast negative social impact. “Legalising any product may help inflation come down. But something like cannabis is sure to adversely affect the youths. That is not desired,” he said. Dr Shah also said total ban on cannabis would cause a crisis, even if temporary, in the State’s rural economy. “A large number of common people involved with the cannabis plantations substantially developed their purchasing capacity. Their absence from being active buyers will have an impact,” he said. Assistant Professor of Pharmacology at Agartala Government Medical College, Dr Kaushik Chakraborty, said cannabis extracts were being used in treatment of many diseases in different countries including cancer. “Morphine, cancer drugs are derived from cannabis. Use of cannabis in treatment of Parkinsons disease is currently in experimental stage. There are many medicinal uses of cannabis,” he said. Meanwhile, the Border Security Force (BSF) Deputy Inspector General (DIG), Kailash Chand Poonia said the security agency would use drones to conduct surveillance on cannabis cultivations in bordering areas of Tripura. On August 2 last, BSF seized 3,350 kg cannabis in a single operation from Kamalnagar in Sonamura sub-division. The cache of dry cannabis was stored inside 87 drums 5 feet below ground and camouflaged by betel leaf plantations. The officer said drone cameras were put into action recently and satellite images were being periodically reviewed to detect cannabis plantations. Tripura Police Assistant Inspector General Smriti Ranjan Das said they would also soon start using sophisticated technology for combating cannabis. For now, it is up to sources of the police and a lifetime of their gut feeling to sniff out cannabis farms.